tears at the end. What could be better than that?" "It's a strong plot, and Parks makes the most of it... The novel's final pages are exciting, surprising and deeply moving. How moving? Its ending brought me to tears, and, where books are concerned, such moments are rare. Parks's six novels about investigative reporter Carter Ross won crime-fiction prizes, but this stand-alone carries his work to a new level." 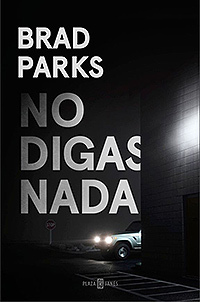 "Parks does a fantastic job conveying every parent's worst fear while also showcasing the marital conflict and mistrust that erupts in the midst of a crisis. The complications and twists build to an unexpected climax that is both perfect and gut-wrenching. Parks's previous novels have been good, but this is his best to date. Fans of Harlan Coben and Lisa Gardner will love this thriller. Don't stay silent, tell everyone." "Shamus Award-winner Parks's excellent domestic thriller credibly portrays a family under severe stress... (readers will) find themselves on pins and needles awaiting the reveals." "Parks dispenses plot twists with a poisoned eyedropper... The nerve-shredding never lets up for a minute as Parks picks you up by the scruff of the neck, shakes you vigorously, and repeats over and over again till a climax so harrowing that you'll be shaking with gratitude that it's finally over." "Parks' legal thriller gets off to a roaring start, plunking us immediately in the middle of things... We're here for the action, too, and Parks comes through." "What elevates this novel to the first rank of the thriller-whodunit hybrid is (Parks's) storyline, which begins by shocking the mind and ends by shattering the heart. The work of an author who continues to raise his sights and refine his immense talent, Say Nothing marks a significant departure into darker realms. And readers will quickly say 'yes' to this spell-binding, disturbing novel." "Some books, especially stories about children acting nobly, make me mist up. But real tears, enough to require dabbing eyes? That does not happen. Yet as I finished the former Star-Ledger reporter's latest book, I was crying... Brad Parks has been very good for a long while now... Say Nothing takes Parks to a new level." "With the fascinating backdrop of the U.S. judicial system, this outstanding race-against-time psychological thriller is as much a tale of family dynamics as of criminal behaviour, as the judge even starts to suspect his wife of being involved with the kidnap. The old cliche of page-turner is dead right here. This twisted tale is written with such power and intelligence that you have no option other than to read it under your desk at work." "It's a tale that grips the reader from the get-go and doesn't let up until the final twist in a story that's filled with surprises." "We are only 60 pages in. Our fingernails are bitten to the quick. Our stomach is in knots. 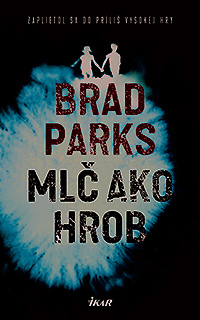 Author Brad Parks has us as hooked as a marlin on 130-pound test... His growing fan base will be clamoring for more." "Riveting... Say Nothing is a fast ride with plot twists and cliff hangers at every turn and a heartbreakingly explosive ending. For lovers of suspense, and even those who only occasionally partake, this story will satisfy and leave you thinking long after it's over." "When I get asked what book I would recommend, Say Nothing is now my first answer. I have just spent the last two days pouring over this thriller, devouring every word and I cannot say too many good things about it. Let me save you a skip to the foot of the page: Say Nothing gets an epic five stars from me... Brilliant, brilliant storytelling." 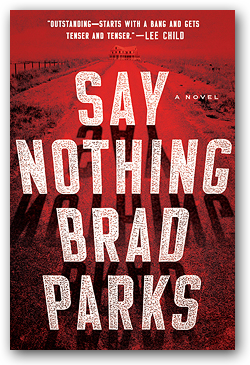 "Written with the perfect blend of Harlan Coben's trademark suspense and a Joseph Finder-like conspiracy, Brad Parks' Say Nothing will leave readers completely speechless. If you're searching for the next unputdownable thriller, here it is!" "Outstanding—starts with a bang and gets tenser and tenser. Say Nothing shows Parks is a quality writer at the top of his form." 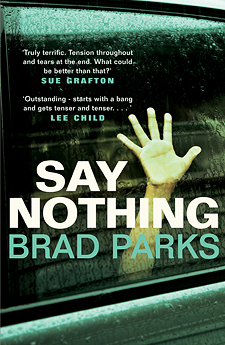 "Say Nothing moves Brad Parks onto the top shelf of thriller writers. He grabs readers' hearts in the first chapter, and doesn't let go until the last line." "A pedal-to-the floor thriller! Say Nothing grabs you from the first few paragraphs and never lets go. Writing in sharp, no-nonsense prose, Parks perfectly nails the dynamics of a family under the gun and has conjured a plot (did I mention high-speed?) that leaps straight from today's headlines. This novel's a winner!" "Say Nothing is tremendously satisfying, packed with engaging characters and surprising plot twists and a furious build of tension until its gut-wrenching pay-off." "Grips you in a vice from the very beginning, and shreds your emotions. Terrific, powerful storytelling at its very best. A tour de force."